Now that summer is just around the corner, so is grilling season. I gave my grill a good cleaning after the long, wet winter and am so excited for all the barbecues we are going to have with our family and friends. This chicken is amazing! We all love it- even the kidos. I make a few skewers for them without "vegetables", but the rest are loaded up with chicken, bell peppers, red onions and pineapple. Grilled pineapple is so good, especially when it is coated in this marinade. It caramels beautifully, I seriously would just eat skewers of grilled vegetables. In a mixing bowl whisk together ketchup, brown sugar, soy sauce, pineapple juice, 2 Tbsp olive oil, rice vinegar, garlic and sesame oil. Stir in 3/4 tsp pepper and season with salt if desired. Place chicken in a gallon size resealable bag. Reserve 1/2 cup of the marinade in refrigerator then pour remaining marinade over chicken. Seal bag and refrigerate for at least 3 hours. Preheat a grill over medium heat to 400 degrees. 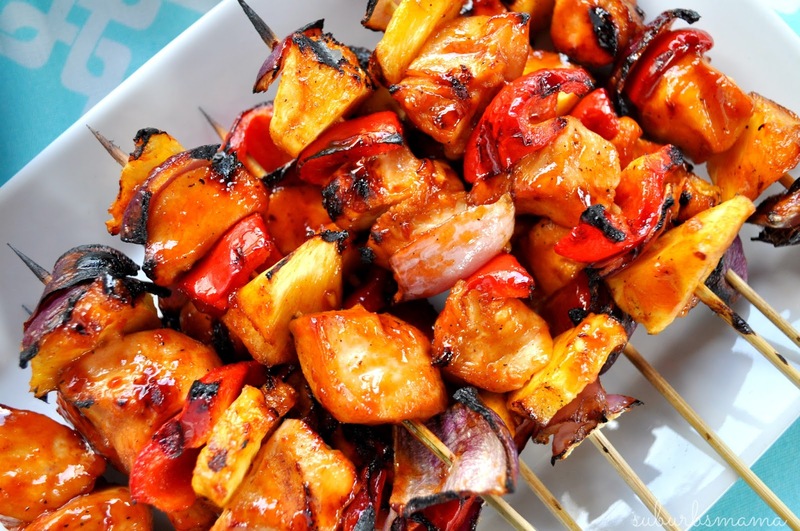 Thread red onion, bell pepper, pineapple and chicken onto skewers until all of the chicken has been used. Brush grill grates with olive oil then place skewers on grill. Grill about 7 minutes then brush along tops with 1/4 cup of remaining marinade. Rotate to opposite side and brush remaining 1/4 cup of marinade on opposite side and allow to grill about 7 minutes longer. The chicken should be beautifully brown and caramelized. Hi. Your side dish caught my eye- is that cucumbers or zuchinni? I'm looking for a way to use up all my garden zuchinni (other than zuchinni bread/muffins). 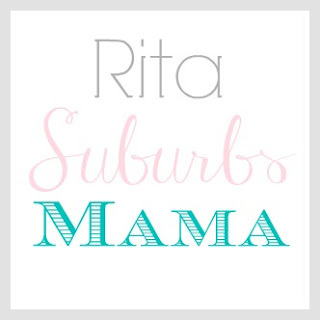 Thanks for all the great recipes and beautiful photos. They are cucumbers. Just a simple cucumber tomato salad. 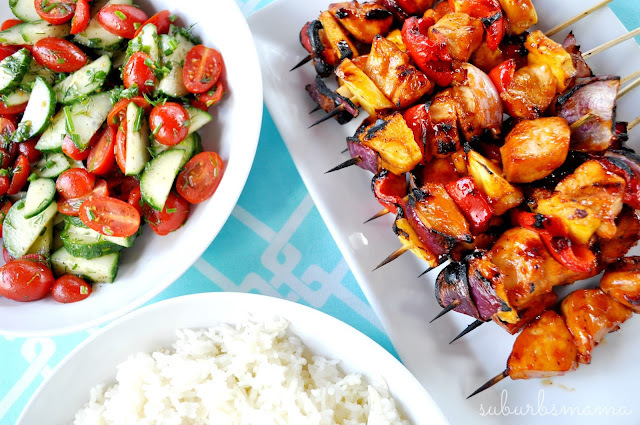 Hawaiian Chicken Kebabs - these are incredibly DELICIOUS! My Whole family and I loved them! Perfect for a summer meal. Tender juicy chicken layered with a rainbow of veggies in a tangy Pineapple Honey BBQ Sauce. The perfect quick & easy summer meal! Thank you, they are incredibly mouth watering.